Our Online Bible Study Community is going strong and growing! We started this year off reading, writing, praying, and studying the Book of Galatians with great success. I tallied up the other day for my own knowledge how many verses we have written since our community began. I also Googled around and found an approximate word count. The numbers are incredible! Since our Online Bible Study Community began, we have read, wrote, prayed, and studied the Books of Philippians, Colossians, James, 1 & 2 Thessalonians, Galatians, and Psalm 119. We each use our own preferred translation, so these numbers might vary a little from person to person. In the last six months, we have written 768 verses and almost 10,000 words!! Those numbers are impressive, at least I think so. But what I see more than the numbers is the time. Those numbers represent a daily commitment to spending time in God’s Word, an endeavor we will never regret. Enrollment for our February study is open, but only until tonight; sorry for the late notice. We all called to share the gospel, the good news of Jesus and His love for us. But not all of us are called to travel far and wide across the globe, or even across the city we live to share Christ. Our most important work is sharing Jesus and His love in our home, and even from our kitchen sink. This Bible study and our online community are tangible reminders that we can serve and share Jesus right where we are. This community and study also encourage us to read our Bible, plain and simple. We don’t have to have a degree, college education, letters after our name, or a dedicated, Pinterest worthy reading spot. The message of knowing, loving, serving, and sharing Jesus right where we are—physically, spiritually, mentally, and emotionally, is woven into everything we do and everything we are. We’ve all heard how important gratitude is. Various scientific studies have even proven the positive effects of gratitude in a person’s life—mentally, physically, emotionally, and spiritually. But sometimes I think we either forget or many of us may not even know the root of gratitude. Too often I think gratitude comes off as some trendy fad based on the latest in Christian literature or sermons circulating the internet. But that quote above reminds or reveals to us the fundamental purpose of gratitude, to lead us to a more mature commitment to the gospel. I’m excited to dig into Ephesians this month in our Online Bible Study Community! Studying this book intrigues me because too often I equate the Book of Ephesians solely with “Wives be subject to your husbands” and “Put on the armor of God.” I’m ready to uncover the hidden—to–me treasures found in this epistle, and now, to gain a greater appreciation of God’s blessings in my life. Here are the specifics. Each of us prints off a daily Scripture Writing plan and a set of Reflection worksheets for the month. Once a week, at least, we “meet” in a live Facebook chat in our own private Facebook group. We have weekly prayer threads and share other encouraging information, tips and things we’ve read. It’s a lovely group of ladies in an often noisy and obnoxious platform. 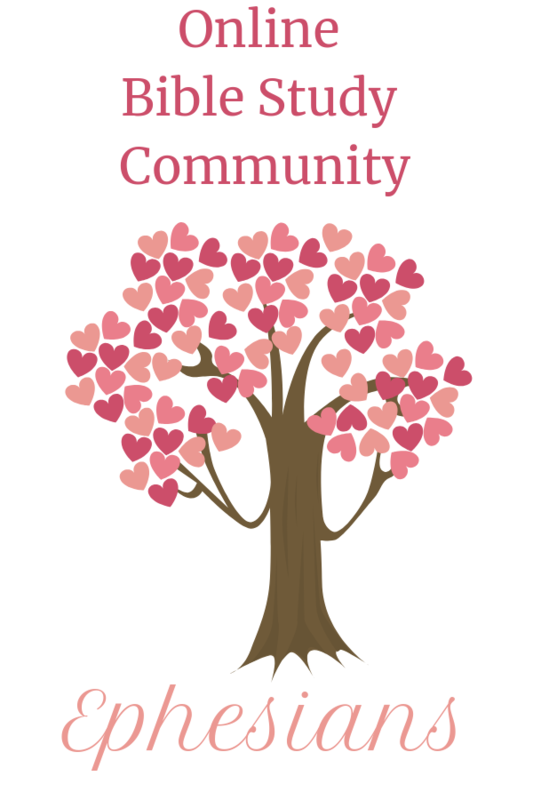 There are some who don’t want to join an online community but still want the printables. I will say though, I have found for myself, and the ladies in our community agree, that having a group not only encourages, but also helps with accountability. But never fear I have good news! I have made each month’s printables available in The Littlest Way shop. You can purchase one or all and work through them at your own pace in your own time.